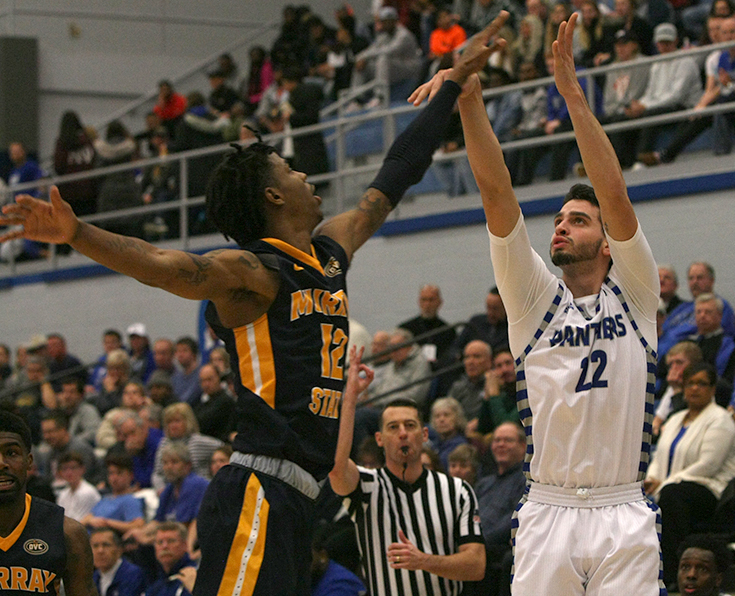 Eastern guard Josiah Wallace puts up a three as Murray State’s Ja Morant closes in Eastern’s 83-61 loss to the Racers on Thursday in Lantz Arena. 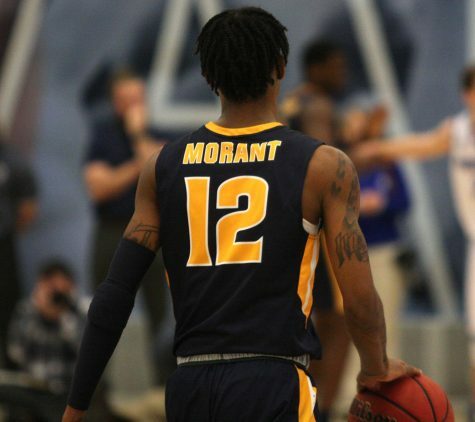 Morant had a game-high 27-points in his team’s win. 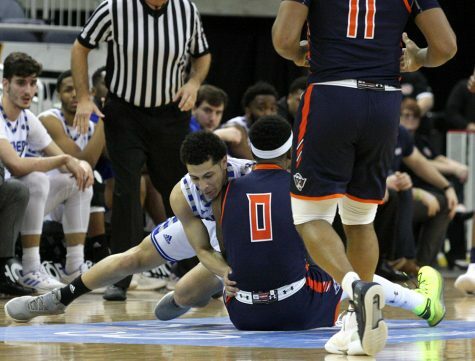 Eastern knew what it was up against when the Panthers (10-8, 3-2) tipped off Thursday’s game against the high-powered Murray State (14-2, 5-0) offense, led by projected NBA lottery pick Ja Morant, in what ended with an 83-61 Racer victory. 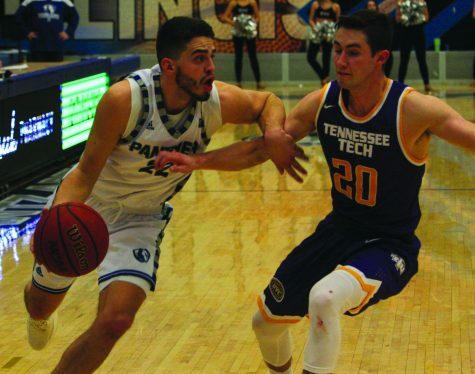 Aside from the Racers’ efficient and potent offense, which shot 42.9 percent from three-point range and 52.3 percent from the field overall, their defense suffocated Eastern into taking a lot of contested shots and shooting 36.4 percent from the field and 33 percent from three-point range. The Murray State defense played good defense inside the three-point arc, forcing Eastern to move the ball around the perimeter for the most part. Eastern did score 28 points in the paint, but even then, the Racers always had a body on the cutting or driving Panther. Eastern head coach Jay Spoonhour complimented Smith’s comments, saying the Racers played tough defensively. Eastern trailed at halftime 48-29, facing a possible, even worse, blowout than what was already being played out. But Smith scored 14 of his team-high 22 points in the second half, giving Eastern a little life during the first part of the second half. 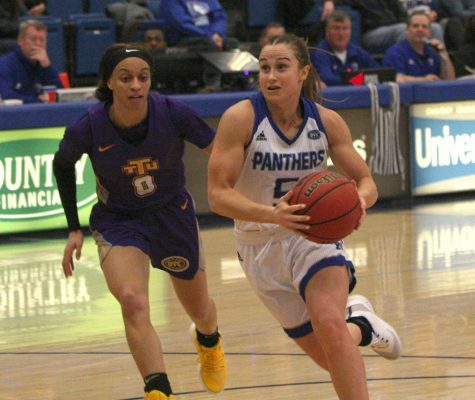 Smith scored 10 points between the three-minute mark into the second half to the point where there were nine minutes left in the game. 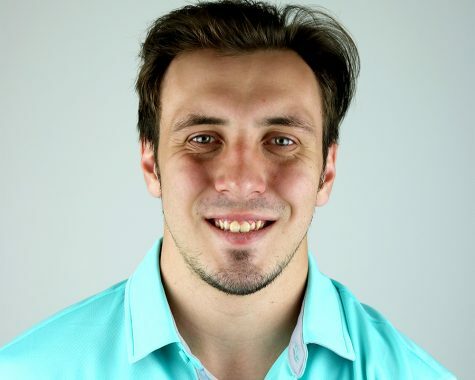 “I wasn’t trying to go out there and tell myself, ‘Alright you need to score, we need to score and be that guy,’ I just stepped up my level,” Mack Smith said. On the flip side of the Panthers’ down night offensively, Spoonhour said he thought his team played good defensively. 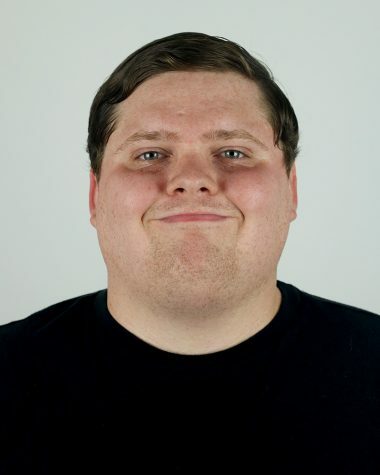 One thing Spoonhour mentioned during the days leading up to the game was that his team could not let Murray State play fast and get a lot of chances on fast breaks and in broken courts. Even though Murray State held large leads throughout the game, Eastern had some runs of its own and some good offensive and defensive possessions. And overall, despite the score and the highlight plays from Morant, Eastern did not have a bad game. Eastern showed some heart and some fight early on in the first half, punctuated by Aboubacar Diallo staring down Morant, the man of the hour, after blocking one of his shots. Eastern held a 7-5 lead three minutes into the game, when Rade Kukobat made a layup, assisted by Ben Harvey. But Murray State quickly countered with an 11-2 run over the next 3 1/2 minutes. For nearly the remainder of the half, Murray State would hold a lead that staggered around 13-18 points. Even so, the Panthers would match the Racers basket-for-basket for a little bit, putting up a fight. 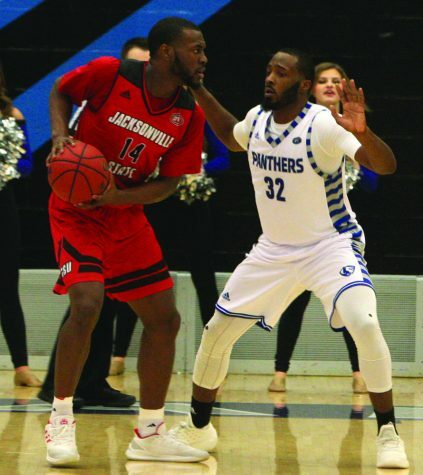 The Racers moved the ball around quickly on offense and dominated inside, outrebounding Eastern 24-19, scoring 12 second-chance points to Eastern’s six, and had 28 points in the paint to Eastern’s 10. 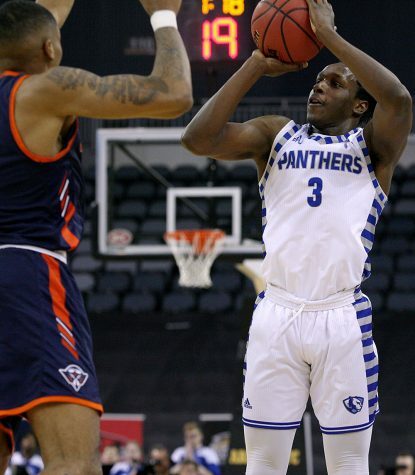 Shareef Smith led the panthers with nine points, all off three-pointers. Mack Smith and Kukobat each had eight to compliment Shareef Smith’s effort. But as the first half came to a close, especially in the last 4 1/2 minutes, the Racers closed the half, outscoring Eastern 11-6, sending the panthers to halftime with a 48-29 deficit. For the game, the Racers outrebounded Eastern 48-32 and outscored Eastern 44-28 in the paint. 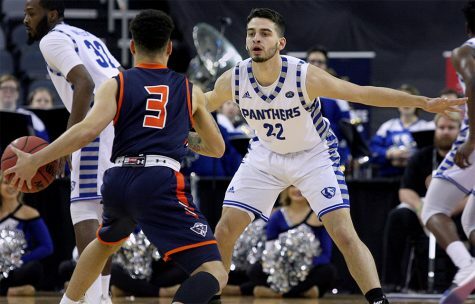 Only two other Panthers finished the game with double-digit scoring: Kukobat had 12 points, and Shareef Smith had 13 points. 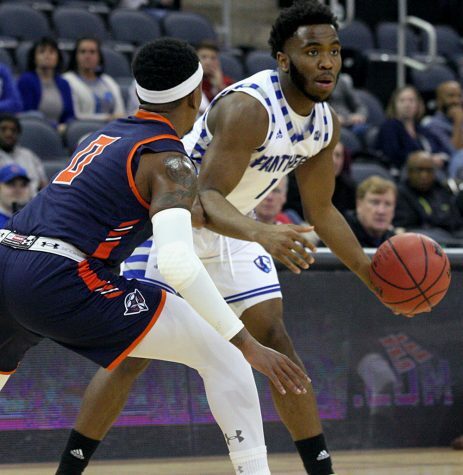 The Panthers have another game against one of the OVC’s tough teams Saturday, when they host Austin Peay at 3:15 p.m.